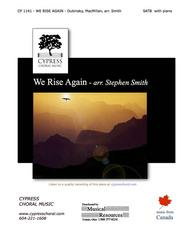 We Rise Again (SATB) arranged by Stephen Smith. For SATB choir and piano. Octavo. Published by Cypress Choral Music (C3.CP1141).Leon Dubinsky's well known coal miners song was made popular by the Rankins, and this arrangement by Stephen Smith has been sung throughout Canada and the US by the men's choir, Chor Leoni. A great crowd pleaser, this accessible version tugs at the heart strings of all who see children as our hope for the future.